It’s always kind of special to arrive at Pasaj-Cap. By boat or by road, either way it’s a feeling of heaven…. You will never forget the impressive view from the property gate or from our private dock. Through the contemporary architecture you can take advantage of the spectacular views. You experience yourself soaring between the crystal clear water and the beautiful volcanoes. With its 6 meters wide windows, imagine the panoramic view you will enjoy! The woodwork with mainly red cedar and other tropical essences is one of remarkable workmanship. The general atmosphere in the apartment has a magical texture inspired by the Moroccan Tadelakt, a really special touch all over floors, kitchen, bathrooms and structures. A minimalist ambience with high ceiling, generous dressing room, roof terrace... the very pleasant wooden podium to lay down in the hammock by the window and enjoy the view. How about taking long morning swims in the blue/glass looking waters and then reading in the gardens by the lake. Accesses and entrances have been carefully imagined and at some point you will not even notice if there are more people around. With its road and boat access, you have the freedom is to go around at any time, the way you like, taking at the same time advantage of those contrasts like the party town of Panajachel (30 minutes), the holy mystic ambience of San Marcos (5 minutes), the traditional and colorful Mayan village of San Pablo (10 minutes) and your own backyard. You are always welcome if you may need assistance to make your stay more enjoyable : maid service and cooking staff can be arranged for an additional fee and other support services (trips to Chichicastenango, Antigua, Airport, yoga sessions, boat trips where ever around the lake, Spanish lessons, guide to climb a volcano, paragliding instructor etc.) are available. The way of life in Lake Atitlan is magic. You will be surprised how rich and creative is this area with an amazing selection of activities. Therefore a lot of people from all around the world decided to stay and develop what they liked more. If you want to know more about it, we will be pleased to send you detailed information. Depending on what you are looking for and how many people you are, we are able to offer the adjusted solution. If you need more space than this apartment of 850 ft² with all amenities with 2 dbl beds, it is a possibility to rent two apartments together (1600ft²)or the additional guest room. - 5 acres of beautiful sceneries of land. Both road ( mototaxi services) and boat accesses ( public boat service). - Excellent quality of the services provided by our team of workers . - Best security. - Modern architecture with all the comfort. - Close enough to the charming village of San Marcos for shopping or going to restaurants but far enough to live away from all the noises, right in the middle of an amazing nature. Spectacular from sunrise till sunset. laundry service available with an additional fee. Jump of the sauna dock right into the lake at night, one of our favourite. A very efficient sauna for up to 6 guests. Peace with beautiful lake view. We loved how quiet the place was yet only a 12 minute walk to town. Pierre and his staff were attentive and helpful. We stayed in unit 4 which came with a roof top patio. Incredible views of the volcano's and lake. The stars and sunrises were incredible! We loved the home and property. The pictures did not reflect the accommodations but it was still beautiful and comfortable. Incredibly special place! I will definitely return. As a seasoned traveler, I appreciated the attention Pierre and his staff put in to accommodating my needs: everything from transportation to changes in my travel plans. It’s a very clean, beautifully kept property with the most unique artistic design that matches the lush landscape of Lake Atitlan and the San Marcos la Laguna area. Walking or tuk tuk transportation into town was always easy. Boat rides to San Pedro and Panachael were also easy. I will treasure memories of the full moon, opening walls of windows (with no bug issues), and the early morning splendor of a refreshing swim! My eyes were constantly overwhelmed by beauty, birds, gorgeous flower and plant life, and the smiles of everyone I encountered. Clean towels and all I needed for comforts in the kitchen, also. I slept like a baby! Safe for a single female traveler: I felt 100% safe every moment! Though I will return with my sons and/or for a romantic destination. Definitely! We couldn't have asked for better experience! Pierre was responsive and very helpful throughout our stay. This is a stunning property in the perfect location close to San Marcos. We swam off the dock multiple times a day, cooked our own meals from our kitchen overlooking the lake, and cruised around the various towns around the lake. I honestly couldn't recommend this place more! We had an incredible stay at the property owned by Pierre! He was able to coordinate transportation to us to get to San Marcos and back to Guatemala City after our stay. He was a kind and attentive host who made sure to check on us when we arrived and as we left. The property itself is amazing - safe and secure, peaceful, and has private docks and outdoor areas right at the lake. We felt like the only ones there! Overall, I would return here in an instant if I could. It was the best few relaxing days on the lake, and we couldn't have been more fortunate with our accommodations! 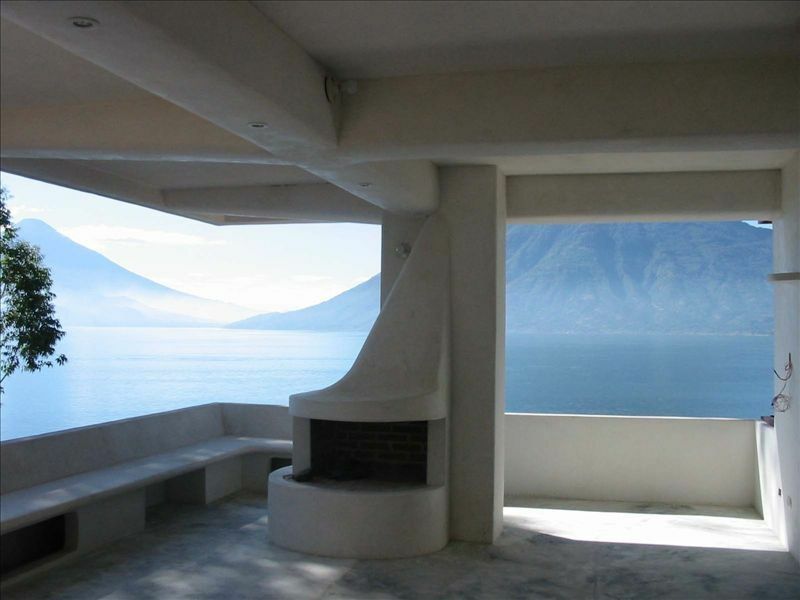 Lovely house designed with lots of windows for breath taking views of the lake and volcanoes. One of multiple dwellings located securely behind a gated perimeter. The house had a modern kitchen, lots of open space and a fireplace and bathtub. It has its own private dock, sauna, viewing areas and massage area. A small bathroom for two bedrooms, and hit and miss hot water would be the only critiques. The house sits up from the water and a steep climb up and down from the dock, plus entry and exits from the water taxis may provide a challenge for those with health limitations. Our overall experience was wonderful and we have already recommended it to others. Lake Atitlan is a Magical place and Pierre was a wonderful host who checked on us throughout our stay.